I have waited way too long, and I have no excuse why I have not started cooking rotisserie chicken sooner. This may have been the juiciest, most flavorful chicken I have ever cooked. I cooked this chicken on my newest grill, another Weber Performer. I used this Rotisserie which fits right on top of my Weber charcoal grill. I brined the chicken first. Brining helps ensure the chicken stays moist. Its basically water, salt, sugar, and I also added garlic. I then put that in a big ziploc bag and let it sit in the fridge for a few hours. I always put my Ziploc brines and marinades in a bowl just in case I did not close the bag properly. Keeps me from getting yelled at if my wife finds the bag leaked all over in the fridge. I set the grill up for indirect heat by putting the coals in side trays. I also put a tin foil pan under the chicken. That catches any drips and keeps my grill cleaner. Now you also need to truss the bird with butchers twine. My trussing technique needs some practice. I used probably twice as much twine than I should have used. Next time I will do a little research on this first. The main reason for trussing is to keep the chicken from flopping around on the spit rod. It also keeps the bird held together as a tight package which helps it cook more evenly. Once the bird was trussed and on the grill I sprayed it with olive oil using my sprayer. I then seasoned it with kosher salt and fresh ground black pepper. I set the grill temp to 350 degrees and left the bird spinning for less than an hour. I removed the chicken when the breast temp hit 160 degrees. I then foiled it and let it rest about 15 minutes while I got the rest of the meal ready. The chicken temp will continue to rise while the bird rests under foil. If you leave it on the grill until it hits finished temp you may end up with a drier, overcooked bird. Mine came out perfectly. And the entire chicken was fully cooked. If you have not cooked rotisserie chicken yet, you should. If you are waiting for some unknown reason, like I did, to get a rotisserie, stop waiting. I have used it a number of times already and I will probably wear that thing out! Its not just for chicken, I cooked a great roast beef on it too. 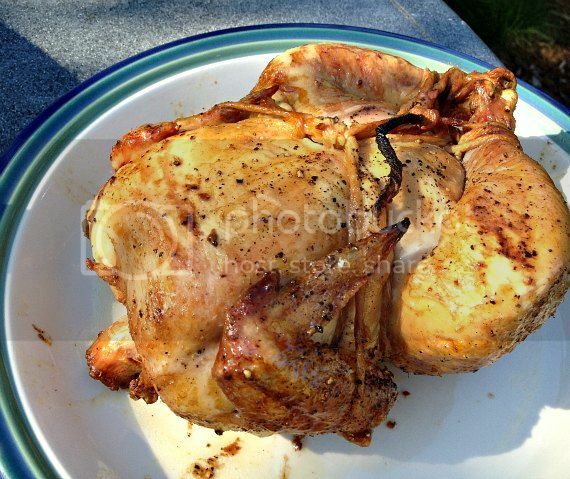 Rotisserie chicken with a garlic brine cooked over charcoal makes a fantastic meal. Add salt, sugar, garlic to water and mix. Put chicken in a large Ziploc bag. Add brine mixture to Ziploc bag. Seal bag, place in a bowl, and put in the fridge for 1-4 hours. Remove chicken from ziploc bag and truss it onto a rotisserie spit rod. Set up grill for indirect heat, temp at 350 degrees. Spray trussed chicken with olive oil, then season with some salt and fresh ground black pepper. Put spit rod onto rotisserie ring, start motor, and let it spin for 35-45 minutes before checking meat temp. Remove chicken when breast temp hits 160 degrees. Cover chicken with foil and let it rest for 10-15 minutes which will allow the internal temps to climb further. Does your rotisserie sit flush in the performer? Yes it does sit flush in the performer.